You can see my 2015 year in review here. If you are interested in last year's goals, you can see them here. 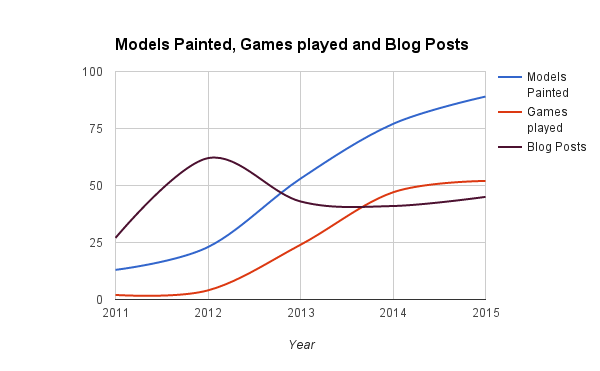 In 2015 I set personal bests for the number of models I painted 89 models and played 52 games in total. I don't think I can best those totals this year as my focus is changing somewhat. 2 years ago I moved to a fairly small town (30,000 people). I haven't yet found any regular opponents for miniatures games. Lately though, there have been some interesting developments. I've joined a boardgame meetup group that is rapidly growing and have been introducing some people to X-wing. I've also been playing some Malifaux and X-wing with another gaming group in a nearby (by Canadian standards, a 1 hour drive away) town. My first goal for 2016 is to hold 4 demonstration games for new players. It could be Malifaux or X-wing or Flames of War. I want to play 4 or more games expressly with the goal of introducing new players to the game. Last year I entered an X-wing tournament in November and thoroughly enjoyed myself. There aren't too many events in the local area so I want to take advantage of the ones that there are and expand my gaming repertoire. My goal is to play in events in three different games in 2016. At the moment, I envision this being Flames of War, Malifaux, and X-wing tournaments. In 2016 I entered a painting contest at Attack-X. I entered models in 4 different categories. In 2016 I want to push myself to enter at least two competitions (not including just tournament Flames of War painting contests). I found that painting competition display pieces really pushed me to improve my painting skills. 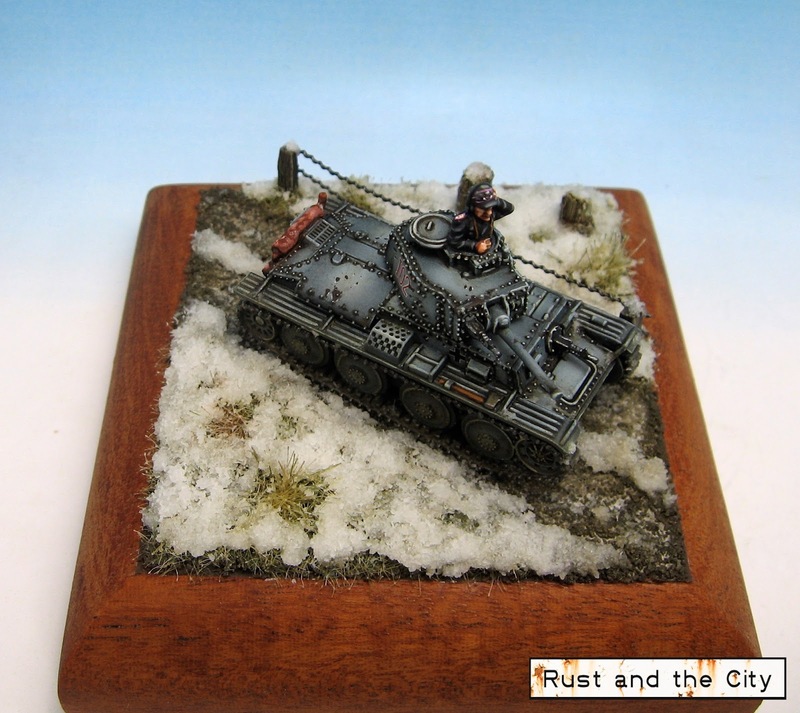 I'd like to push myself to complete some good competition pieces for 28-32mm scale competitions. 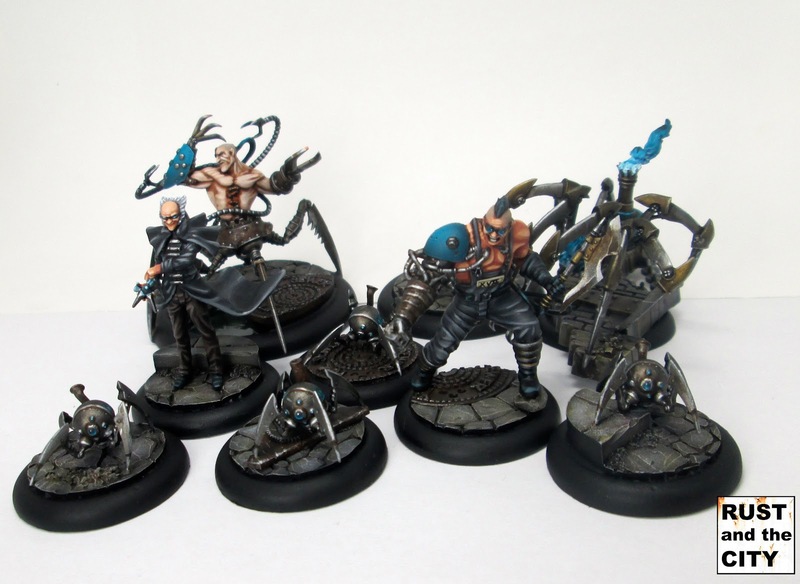 Any ideas for a five model Malifaux box set to paint for a competition? I want to increase the diversity in my painting by painting at least 10 models in 3 different games or scales. 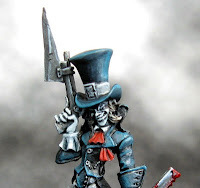 For example, at the moment I envision myself painting 10 Flames of War models, 10 6mm models, and 10 Malifaux models. This could change though. You'll notice I have ommitted "buy nothing" goals this year. This is purely in the interests of saving the Canadian economy and bringing our dollar back to par with the American dollar. I don't want to create a Malifaux pile of plastic doom. I bought 2 Malifaux boxes around 4 years ago and haven't finished them yet. This year I painted lots of Arcanist models. I'd like to catch up on the small Malifaux backlog and paint the rest of the little bits and pieces I have sitting around. I'd also like to paint another master or two (Collette probably). Seamus has some Belles that need a little more paint. What's the point of painting all of these models if I don't play with them? I'm counting everything here. Flames of War, Malifaux, X-wing, board games, and cribbage and scrabble with my wife. I may not have the time for 40 Flames of War games this year but I would like to continue playing a range of different games throughout the year. Well, there are my goals for 2016. Every year I think I make very attainable goals and every year I realize I have failed miserably at sticking to my goals when I do my recap at the end of the year. What do you think, will I achieve my goals this year? Have you set any hobby goals yourself? I'd love to hear about them in the comments below. Blimey! You're so organised. I have a rough idea what I'm doing, but I get so easily side-tracked that my plans change all the time. Hope you have a fun and productive 2016! I think the 40 games might be a strain, but then maybe not with all the demo games and tournies you plan to run. Looking forward to all these things being taken care of. THe mix of different, non-15mm WW2 minis listed will hopefully help keep you eager to continue painting and achieve these goals. Good luck mate. This hobby year is going to be a good one I think. 40 games is a lot. Between all of the different games hopefully I will get there. Playing x-wing and Malifaux make for more potential games. I'm hoping that mixing up the models and scales will help to keep things fresh. I was getting a bit burned out on painting Flames of War models. 28mm - if you're looking for interesting sculpts for competition, I've been liking the soliders that Hasslefree does, and a lot of stuff that Corvus Belli has been doing for their Infinity game. Perhaps you can find something there that you like if you can't find a Malifaux gang to your liking? 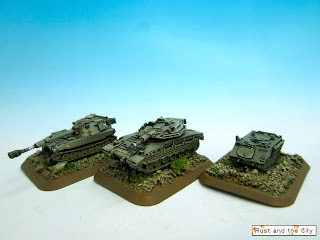 6mm vehicles - I've been having good luck painting them a reasonable base color (or series of base colors in the case of a striped camo pattern), painting the treads and wheels black, and then weathering and highlighting them with inks. I know some people paint the whole thing with inks. I do find that they paint up quickly and a good quality sculpt makes all the difference in popping the detail. Thanks Matt. I've been eyeing up infinity models for a while. I've heard how nice the sculpts are but haven't chosen one tovpaint yet. Any recommendations? So, my answer is long and convoluted, but it makes sense... I don't actually play Infinity (too many games with no one to play with already - like I said, my town has like 1750 people in it, and all the local games shops in the surrounding communities are basically just places for people to play Magic). However, I have been playing a bit of This is Not a Test and have been keeping an eye out for minis for it. If you like the aesthetic of the Fallout/Wasteland series of video games and Mad Max, and if you remember Mordheim, with the idea of an "RPG Light" sort of play (your guys gain experience, etc. ), then I suggest checking this out. Most of the community activity is in their Facebook group, BTW. So, to that end, I've been looking for models. I also read a lot of Larry Correia's books, specifically Monster Hunter International and the Grimnoir series. If you like "urban fantasy" in the style of the TV show Supernatural, (no sparkly vampires here), written from the perspective of someone who is a professional firearms instructor and used to own a machine gun store, I suggest checking out his writing. Since I read his books, I follow his blog. Since I follow his blog, I saw this post about his Ariadna army, and I thought those minis would work very well for former military units "left over" after the world ended in the This is Not a Test game. But, looking at the sheer variety of models in that army alone, there's a lot of stuff that looks really decent. I like the guy with the fire axe in particular. But there's the TAGs that are their mecha-type things, and several different models on motorcycles... basically, they seem to be trying to scratch everyone's itches. I like the look of the ariadna stuff. I've heard of this is not a test on the behind enemy lines podcast. It sounds really fun. I've found it hard to find people to play niche games. I've been trying to stick to the bigger games.